Hey, thanks for the shout out! I can’t wait to read your blog now, too! aw your creativity isn’t gone, just buried. 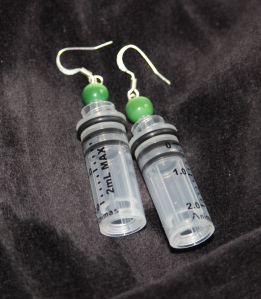 Those syringe earrings are awesome though!! will not solve your problems. carries danger, awareness and fear. lurking around the dark … finding whispers. The answer is to never stop believing. And I immediately thought of the picture of you with the headlamp so I came out to your blog. 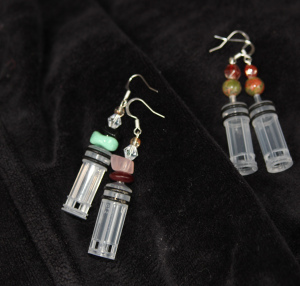 We are totally making earrings today. Thanks always for the fun. I absolutely love the reservoir earrings! What a creative idea! The brain pictures totally made me chuckle! I can so relate!